This .30-06 Springfield ammunition from Prvi Partizan differs slightly from most ammo in this caliber in that it is loaded to M1 Garand specifications. 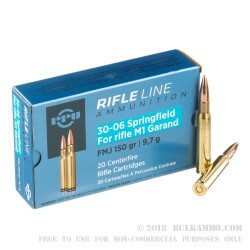 This M1 Garand ammunition is specially designed to have the correct pressures to function properly in your Garand without damaging your op rod. 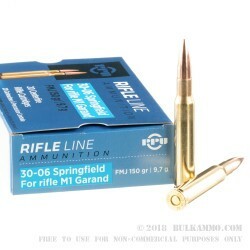 Most modern 30-06 ammo features pressures that are too high to be used in an M1 Garand and are instead designed for a modern bolt action hunting rifle. This makes it a great choice for CMP rifles. 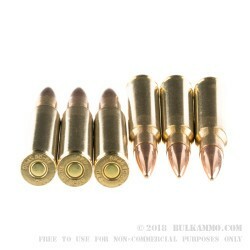 Each cartridge in this bulk priced case of 200 fires a 150-grain full metal jacket bullet at a muzzle velocity of 2,745 feet per second; this lower velocity reflects the slightly reduced pressures of M1 spec ammunition. Prvi Partizan ammo has been made in Uzice, Serbia since the company's founding in the 1920s. Their products originally served primarily hunters and military contracts; however, PPU has also become one of the top range ammo manufacturers as well. 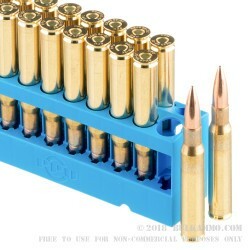 PPU ammo uses non-corrosive Boxer primers and reloadable brass cases. Q: Is this ammo bimetal jacketed? Will it attract a magnet? A: Hi John! This Privi ammo is NOT magnetic. It has a copper jacket and a lead core and will be fine to use at your range.